The Indiana State University Foundation Thursday (Dec. 17) announced the hiring of Roland Shelton as assistant vice president for constituent relations with the foundation and general manager of the Terre Haute Rex baseball franchise. Amy Huntsinger was also named marketing coordinator for the team. Shelton, of Olathe, Kan., brings a wealth of management experience to the position with over 19 years of service in higher education and with Fortune 500 companies. As general manager for the Rex, Shelton will run the day-to-day operations and oversee all aspects of the team, including personnel, budget, operations, facility management, and marketing. "This position is a great opportunity for me both professionally and personally," Shelton said. "The foundation's addition of the Rex complements an impressive community investment portfolio. My family and I are looking forward to getting to know the Terre Haute community." 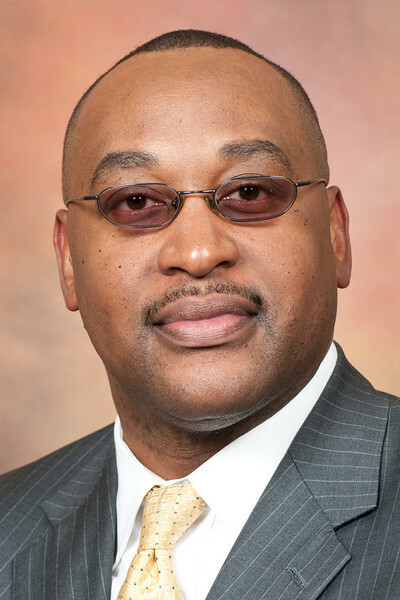 Shelton's professional experience includes positions at General Motors, Philip Morris USA, Coca-Cola USA, and Campbell Soup Co. His career in higher education career began in athletics development at his alma mater, Western Kentucky University. His most recent position was as associate vice president for advancement at Park University in Kansas City, Kan.
"Roland is the right person for general manager job with the Terre Haute Rex," said Gene Crume, president of the ISU Foundation. "His substantial experience will be helpful to the organization as he guides the Rex in strategic planning, solution implementation, budget and resource management, and risk identification. He has an impressive resume and has proven his leadership through his advancement in previous positions. Roland will be a great addition to the ISU Foundation and a proficient leader for the Rex franchise." Huntsinger, of Frankton, will also be an important member of the Rex management team in the planning for its first season, Crume said. "With an undergraduate degree in public relations from Indiana State, Amy will be invaluable to the marketing, branding, and communications functions for the Rex," he said. Huntsinger is pursuing a master's degree in communications at ISU. "I am truly excited to have a position with the Rex. My experiences at ISU have instilled in me a passion for both the university and the community," Huntsinger said. Huntsinger has served in a variety of leadership capacities at ISU, including as student trustee on the Board of Trustees and chapter president for Chi Omega Fraternity. Her internship endeavors included positions in marketing at Sony DADC and in special events at the ISU Foundation. "Amy is an energetic and devoted asset to the Terre Haute Rex. Her creativity and communications knowledge will help the team provide valuable entertainment for all fans of the Rex," Crume said. The Rex baseball team is a part of the Prospect League, a collegiate wooden bat summer league. The team is owned by Sycamore Foundation Holdings, a non-profit subsidiary of the Indiana State University Foundation, in partnership with Rex® coffee, a brand of the Clabber Girl Corp. The Rex is set to debut this summer with a 54-game season. The team will be play 27 home games at Bob Warn Field at Sycamore Stadium. Season ticket sales have already begun and are available by contacting the ISU Foundation offices at 812-240-4323. The team logo, uniform design, and mascot will be announced in late January. Roland Shelton will lead the Terre Haute Rex Prospect League baseball team in its inaugural season at Bob Warn Field on the ISU campus.